Mardon Jewelers is a jewelry store in Riverside, CA. We specialize in Custom Jewelry, Jewelry Appraisal, Estate Buying, Jewelry Repair, Engagement Rings, Diamonds and Gemstones and Designer Jewelry. Please take your time and enjoy all the beautiful jewelry we have available. Mardon Jewelers has been proudly serving its customers in Riverside, Redlands, Corona, Rancho Cucamonga, Ontario and the Inland Empire since 1961. If you can dream it, we can make it! Our experienced design staff specializes in bringing unique ideas to life. If you have a specific design that you can't find anywhere else, or even just a vague concept of what you might like, Mardon can help make your dreams come true. 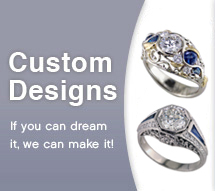 Check out our custom design section today! The Raincross is the famous city symbol of Riverside, and Mardon lets you show your civic pride with our exclusive collection. We've created at least one new design every year since 1993, so there are plenty of choices available! 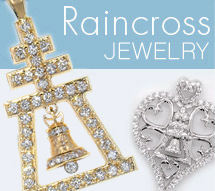 Find the Raincross that's right for you! We have a large and constantly-changing collection of Vintage Jewelry for those looking for something really special. We deal with all eras of Vintage Jewelry, including Georgian, Victorian, Art Nouveau, Art Deco, Edwardian, Retro and Modern. Because diamonds are not the only gem around! We love colored stones, and carry a large selection, including Ruby, Tanzanite, Garnet, Sapphire, Padparadscha Sapphire, Opal, Emerald and much more! If you're planning on getting married, you've probably got a lot of things to think about! Let Mardon help make things a little bit easier by reading our guide to buying an engagement ring. You can learn all about diamonds and see the styles that we have available. A fine piece of jewelry can easily last a lifetime if it's well maintained. 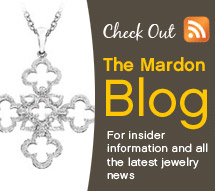 Mardon offers a full range of jewelry services to help keep your items in great condition. Our certified Gemologist-Appraiser can also help with your gem identification or appraisal needs. We're proud to have served Riverside and the Inland Empire for over 45 years. You can learn more about Mardon's history, sales policies, and how to find us in the About Us section.